A permanent, all-metal, cleanable, viscous-impingement filter, the KLEENFLO provides excellent efficiency in air-conditioning and ventilating system. For greater dust-holding capacity and fewer cleaning interval use KLEENFLO. Layers of galvanized screen wire, in carefully selected sizes of mesh, are precisely arranged so that dust-laden air currents are broken up into hundreds of tiny currents. The coarse mesh on the approach face “traps” bulky materials. Media enclosing channels are galvanized steel. Drain holes speed up drainage during servicing. Heavy bail-wire handles are furnished on 2” and 4” thick filters when specified. KLEENFLO filters can be made of different metals to solve a specific problem. KLEENFLO filters are recommended for use only on forced draft ventilation. Optimum net face velocity is 356 fpm. 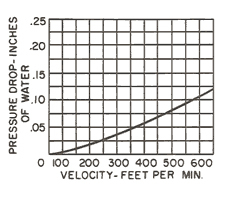 Efficiency of all filters will vary with air velocity and type of dirt encountered. Filtering efficiency of a 2” thick KLEENFLO ranges to 60% at 356 fpm, using standardized test dust and methods. When tested with standardized test dust methods as follows: by weight, 57.7 % fine road dust, 20.0 % K-1 carbon black and 22.3% cotton linters, results increase to over 78%. Wide ranges of standard-size KLEENFLO filters are available. Thicknesses range from ½” to 4”. 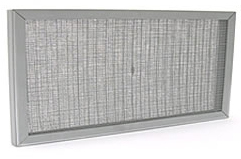 Special-size rectangular filters are available up to 30” wide by required length; however sizes over 600 square inches in 1” thick and 700 in 2” thick are not recommended since they are difficult to handle. The KLEENFLO can be flushed with a solution of commercial cleaner and hot water, and then recoated with an adhesive. Note: Other sizes available on request. Falls Filtration Technologies reserves the right to change any model or specification at any time without notice.